Easily handles the speakers with which I have paired it. Large sound stage. Sound is neutral to warm, and there is never listening fatigue. Has a phono stage. Not enough inputs. Photo stage needs special internal connection to hook it up. Have not used the phono stage, but I recently purchased a turntable and need to learn how to connect it internally to one of the inputs. Great low end control and depth. Warmish,liquid mids,smoothe top throughout the upper spectrum. Audiophile sonics top to bottom. Versatility with simple tube changes. Sounds just as good at low listening levels with no loss of detail or air. This is the new standard in integrateds without peer in this $5K or less range. Except for the guy with the Legacys',great reliability. Really can't think of any other negatives. I feel compelled first to comment on the previous review regarding the guy with the Legacy speakers. I had a very similar experience with Legacy speakers and the monstrous Rotel RB 1090 amp. rated @ 380 WPC. EVERY time I attempted SPL's over 90 db the amp were cycle off via the circuit protection mode on the amp. It occured with other amps as well on the Legacy speakers. I got rid of those speakers after fighting to match an amp up they wouldn't kill for 6 mos. I've never had that occur with any of the MANT systems I've assembled over 30 years of this hobby,but I've now heard of multiple people experiencing similar issues with Legacys'. There,now onto the review. This DK Designs (VS1 Mk.II) is by far one of the most satisfying amps I've EVER heard! It does everything well,to include low end bass control and producing the real low stuff,below 35hz without effort.. The midrange is liquid but differs based on tube choice. Sounstage width,depth,and air,are as good as any I've heard. I'm currently running Siemens E88CCs' with great success. This amp is a tube rollers dream,or for someone who has an inherant problem with their system being overly bright or siballant. Simply swap tubes for an entirely different portrayal of everything from top to bottom. I 've also tried Amperex Bugle Boy 6DJ8s and A frame PQs' with success. The real excitement is yet to come though,as I've got Siemens CCas' coming and cant wait ot hear them. The amp barely runs warm compared to some class "A" designs I've owned and never seems to run out of power,even at obsene SPLs'.Superb build quality throughout,and it sure is nice ,at least for the time being,not to have to own a seperate preamp and seperate amps.Very convenient. Kudos to DK (or LSA) for a great audiophile quality sounding piece at a relatively affordable price point.For $3,000.00 new this is a good value,for $1600-$1800 used it's the proverbial "steal"! Haven't needed them yet,but I have read many favorable things about both DK and LSA from customers who've had to call them for various reasons. Very musical, overall character is that of a tube amp, however, amazing control and foundation in the bass. This is a remarkable achievement. Top panel needs to have some kind of damping material underneath. This review is on the new VS-1 Reference Mk. 3, not the Mk. 2. This amplifier is the finest most satisfying amplifier I have ever owned (or heard). I've owned some very highly regarded amplifiers, but this is better. Without going into all of the audiophile terms, let me just say that music is presented in a completely natural yet exciting manner. I am hearing details in my recordings that I have not heard on other amplifiers. But there's so much more! This amplifier is very dynamic and full bodied. If your feet aren't tapping wildly away at music you enjoy you must be dead. The bass is very articulate and tight and fast, and supports the rest of the range as it should. The midrange is exquisite and also fast, yet without the lifelessness of many other solid state designs. In fact this sounds exactly like a very good tube amp, except it has unbelievable control in the bass region. The highs are just as they should be -very natural, fast and detailed. If I were to use one word to describe the sound, I would say its organic. Images are dense and three-dimensional. The soundtage is expansive with great depth and height. The music emerges from utter blackness. Female vocals, saxophones, drums, etc. all have a presence and "rightness" about them that I have yet to hear in other designs. In my opnion, this amplifier fully deserves the raves it has been getting. Many amplifiers on this site have received 5 stars but most really don't deserve it. Either a new 6 star rating should be created for this amplifier, or most other 5 star contenders should be considered worthy of 4 stars. This amplifier can really communicate the power of music. Super build quality, massive power transformers, ultra quiet background/low noise, incredibly dyanics and awesome control in the bass. Also, very defined and delicate midrange. The unit could probably use more inputs. This amplifier is one of those components that is difficult to overlook; stunning cosmetics, rave reviews, perfect textbook measurements indicating good engineering, all in a 90 lbs. hunk of metal. All this made me rather impatient to try it out. I have heard good things about it, but naturally I was very skeptical especially because DK Design Group is a fairly new company in this industry compared to players like Krell, Mark Levinson, and Jeff Rowland. This integrated amplifier is MASSIVE, this is not one of those puny integrated amps. It acts like a pure voltage source and literally doubles its power when impedance drops and the unit will put out close to 1000W into a 1ohm load without clipping! All this is driven by a tube linestage that sports 6DJ8s. Immediately upon connecting the VS-1 to the loudspeakers, cold out of the box, there was an immediate effortlessness and dynamics that were simply astonishing. I have never, ever, heard this type of bass slam and control from my speakers and it seemed as if the amplifier was actually extending the bass response of the loudspeakers. This incredible bass foundation and control make music listening a very enjoyable and exciting experience. The incredible dynamics and bass lay a very nice foundation as a floor to the music. The music simply soars in the midrange and has a velvety smoothness and a lightness. The presentation is very nuanced and delicate while riding on killer bass and dynamics. This is an incredible quality. Overall, this amp simply cannot be faulted, especially given its $3000 price. Its build quality, musicality, and ability to drive any speaker system (aside from Legacy it seems) make it an unbelievable value. I am a very satisfied owner of the VS-1 Reference. Anyone who lives in the New Hampshire area, please feel free to stop by for an audition. My system is all broken in and cookin'. Strange midrange. Won't Rock & Roll! I had actually purchased 3 of these amps to run my home theater system (Legacy Audio Sig 3's front and back, Silver Screen 2 center and Mist for center rear. The reason I ended up with 4 of them is that DK felt bad about all of the problems I was having and sent me a 4th amp at no charge. That is the only positive that I can say about this amplifier company. Don't get me wrong, I only tested these amps with Legacy Audio speakers and it may be a conflict with these speakers and the amp but I don't know for sure as DK has no intention of investigating my issue further because they feel that there are only a small percentage of people who own Legacy Audio speakers. The problem I experienced was that when you pushed the amp (loud volume, no distortion) with music that had deep, fast, bass notes ( no rap, used classical & rock music), the amp would shut down (sometimes only 1 channel, even the center channel cut out). It would still be lit and the meters would keep bouncing, but no sound. All 3 amps showed this problem. Even the amp at the dealer showed the same problem as the dealer also sells Legacy speakers. I tested these amps on 4 different models of Legacy speakers and the problem was the same, so it's not the speakers and the problem has nothing to do with my hookup at home. DK felt it was the protection circuit in the amp. Long story short, being good with electronics I offered to replace the resistors at my residence. DK sent me the resistors, I replaced them, same problem. I then sent all of the amps back to DK and was assured that the problem would be corrected. DK's one suggestion to me was that "had I considered buying different speaker to replace the Legacy's?" No, I'm not kidding! Bottom line is DK basically concluded that it was either me playing the music too loud or it was a problem caused by the Legacy speakers. I totally disagreed as I told them that I had no problems using an ATI or B&K amplifier on the same speakers (I have gone back to B&K, no problems). I spent a lot of time and aggravation (amps were mounted in a custom overhead rack that had to be disassembled every time the amp needed service and spent hours replacing the resistors for the 3 amps) trying to trouble shoot their problem (they still believe that the amp has no problem), and they refused to buy back the amps from me which has caused me to lose a lot of money as you can see, you cannot get anywhere near the purchase price of $3000 from anyone online (Ebay, Audiogon, etc). I also had purchased Siemens CCA tubes from Germany as DK highly recommended that you roll the tubes to Siemens, so I was also stuck with these tubes. If you want to know the whole story, you can send me an email. On a final note…while the amps were playing I still didn’t like the midrange as it sounded harsh, and yes, I played the amps for about 80 to 100 hours to break them in. I also heard the same complaint from other DK owners. These amps also have a very similar appearance to a Chinese amplifier company’s product http://www.cn-cav.com/product/cav/cav_gf_a8.htm Nothing against Chinese manufacturers, but I thought I would point this out. Be cautious....as this is a new company and there is no track record to predict their future. I for one will not recommend this companies product to anyone! ATI, B&K, Legacy Audio, Velodyne, Integra, Infinity, Elite, etc. This amplifier does everything well and delivers limitless power to any loudspeaker. A total sonic knockout that delivers unbelievable musicality. The sound is extremely dynamic, with a very clean impact and slam combined with a liquid midrange with lots of presence. Very transparent in the high-frequencies with no treble harshness. 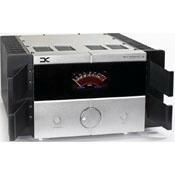 This amplifier made an instant and very impressive improvement in my system. The most impressive quality is how you just can't help but get drawn into the music. I find myself getting goosebumps and going through my entire CD collection. What I find really attractive is that this amp uses both tubes and solid state to achieve a presentation that gives you the best of both worlds. My speakers have never sounded better. 5 Stars all the way!!!!!!!! This amp also gets my vote for being the best value in high-end audio to come along in years. You would have to go out and spend at least 3 to 4 times as much to even approach this level of sound quality.